For most people the introductory trial lesson will be the first time they have stepped inside a helicopter and experienced the ultimate sensation of taking control of an exciting and enthralling machine. You will be greeted by a training co-ordinator who will personally go through the event. * The flight time will be recorded and can go towards a Private Pilots Licence. There is a weight limit of 16 stones and a height restriction of 6 feet for the R22 helicopter. 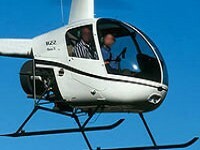 Should you require a different helicopter prices can be quoted accordingly. Minimum age requirement is 14 years of age.